iGoldrush Polls: What percentage of your domain sales were to end users (not domainers)? 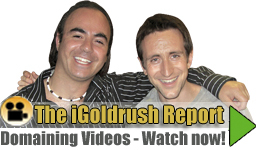 iGoldRush Domain News and Resources > Random Domaining > Polls > What percentage of your domain sales were to end users (not domainers)? What percentage of your domain sales were to end users (not domainers)? Statistics from the past couple of years show a huge increase in end user domain sales. We’re curious.. what percentage of your domain name sales in 2010 were sold to end users rather than to other domainers? See below for the results or Click Here for other polls.